Z War One - Exodus Launches on Kickstarter today! Z War One Exodus Launches today @13:45 BST on Kickstarter! Here we go again... We're back on Kickstarter September 12th with Z War One - Exodus! Own the skies with Air Flix on Kickstarter this May! 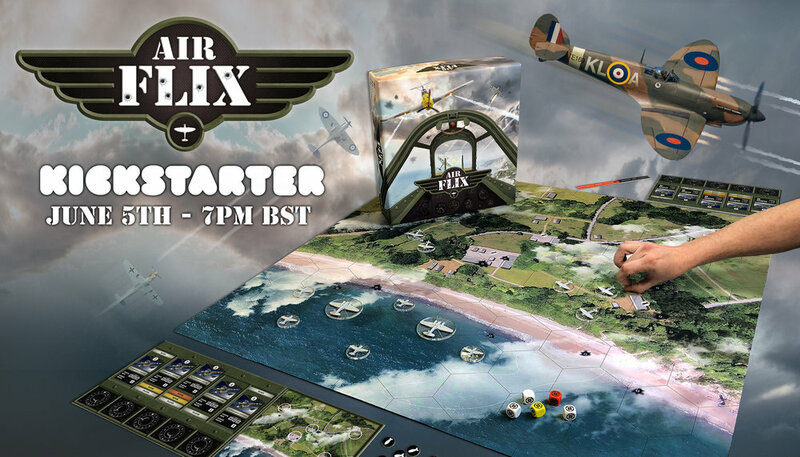 The latest product to join the Dice Sports line up, Air Flix is a fast paced, Second World War, dexterity based dogfighting game for 2 or more players. Slick, intuitive game play, multiple game modes & variants combined with components of the highest possible standard, make this the perfect action dogfighting game for both hardened wargamers & casual players alike. An all action combination of strategy & skill, you will need to out-think and out-flick your opponents to achieve total aerial dominance! 1. Equipment & Crafting. Gone are the days of a magical ammunition re-stock between chapters, Exodus places much more focus on resource gathering, not only are you working to complete your mission objectives, but you are always aiming to finish a chapter with a healthier looking inventory than the one you started with. Searching will be rewarded with much needed ammunition, medical supplies or, much more excitingly, common household objects which can be crafted into brutal instruments of destruction. Tape, weld & glue your way to victory like a post apocalyptic MacGyver. 2. Upgraded (and generally cooler looking) cards. Sometimes when playing Damnation I use quick fire purely because I can't be bothered to add 2 to my dice rolls. If, like me, you want to spend your table time having fun, not bogged down advanced mathematics, the new Exodus ballistic weapon cards now display BOTH quick & aimed fire tables! 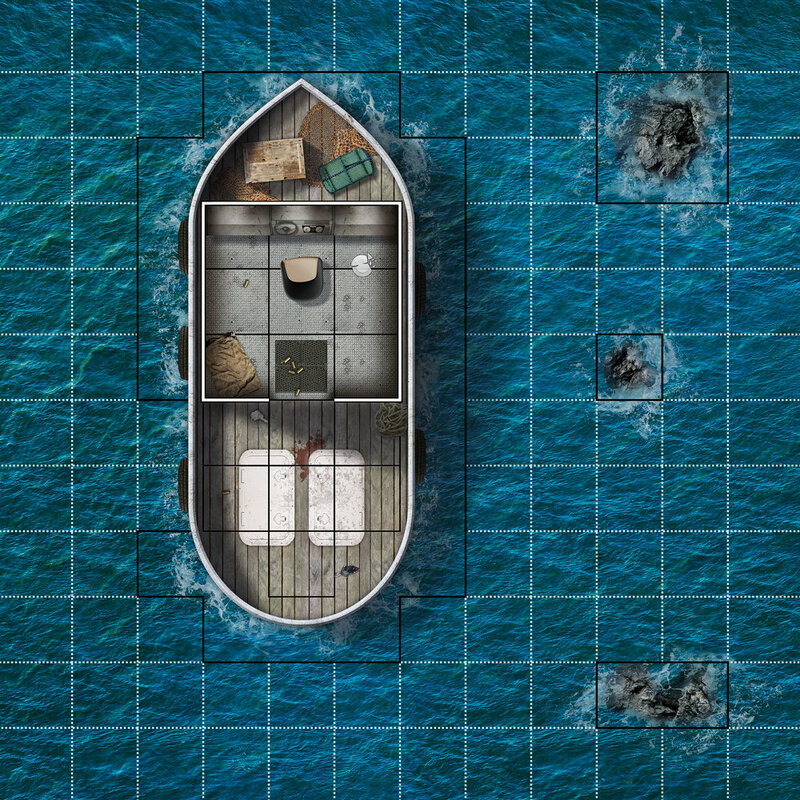 There are some other cool additions too, like crafting recipes for home brew equipment, and area effect diagrams for explosives. No more painstaking adding 2, plus some other cool stuff. 3. Less writing stuff down! It's 2017 and we are changing with the times. Replacing the ZWOD tracker pad we have the tracker board. Ammunition, power perks & infection are now tracked using dials. This was mainly due to the addition of ammunition & the "reload" action although you may also note the lack of infection test, this is because infection now automatically ticks down every turn, take just one bite & without the appropriate medical care you will bleed out in 15 turns. 4. Save Tickets. For those that still yearn for the good old days of writing stuff down, the Exodus campaign uses a "save ticket" system. This means that, rather than restarting a mission in the event of a heroes death, you will instead return to a previous save point. You have 3 save tickets for the 7 chapter campaign, upon successful completion of a mission you have the option to use an available ticket. 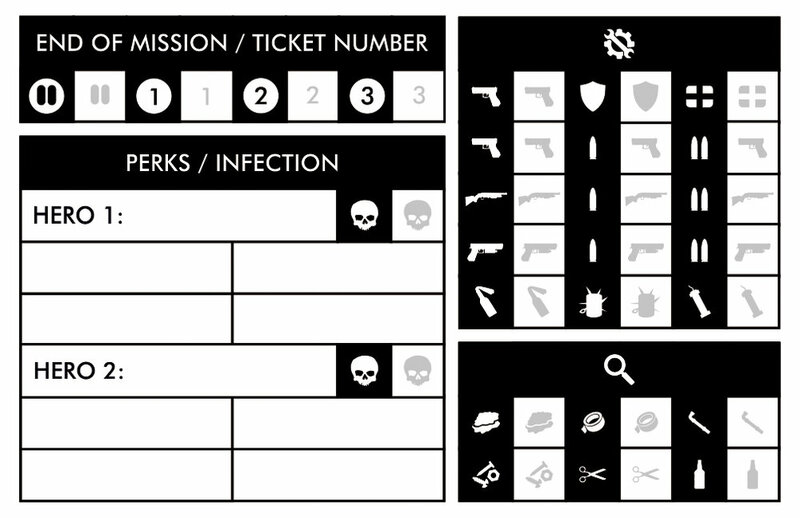 Your save ticket details all the information about your game at the point of the save: ammunition, infection status, perks, equipment etc. in the event of a heroes death, or the player/players choosing to retire from a mission they can restart the campaign from any of their previous save points. These are just a few of the changes & additions, you will be able to check out them all when we publish the full Exodus rule book really soon! Check out the teaser for the upcoming Exodus Kickstsarter! So, after much deliberation behind the scenes the decision has been taken to cancel the Issue 3/4 Kickstarter which was planned for this year. We looked at what we had already done for issues 3/4 and the stuff we were working on for 5/6 to complete the ark and came to the realisation that story works far better condensed into 5 issues. This means that the Damnation ark will conclude with an "all killer, no filler" parts 3-5 Kickstarter early in 2018. Over the last few months whilst Ben has been busy beavering away on parts 3 & 4 of the ZWOD comic, I have been spending most of my time working on another Z War title. 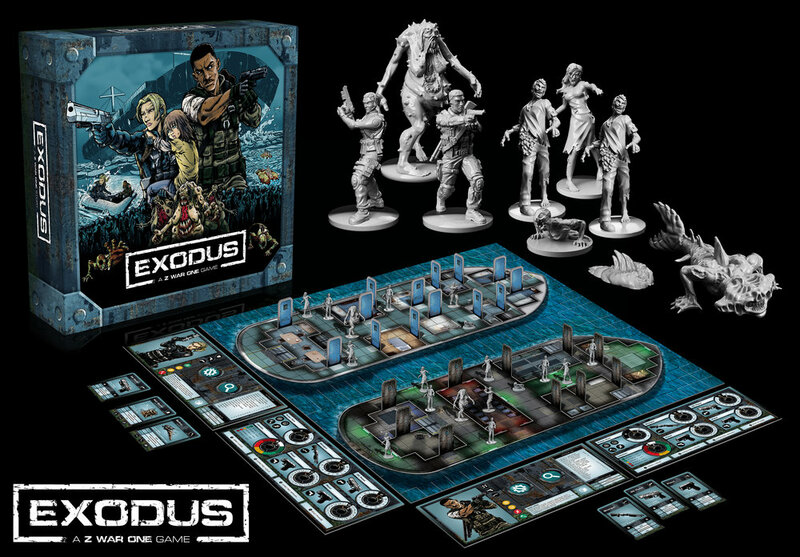 Exodus - A Z War One Story is a solo or 2 player co-operative story/game set in the Z War universe (immediately after the Delta 6 Mission "breakwater" to be precise). The story centres around Captain Kira Chase and Warrant Officer Mike West and their desperate attempt to flee the United Kingdom in the aftermath of the Battle of Glasgow. Tracker Dials - Track your ammunition, turn times & perk usage with rotating dials on your character board rather than pen & paper. Reload - Tracker dials mean that you can load ammunition into your active weapon with the reload action. 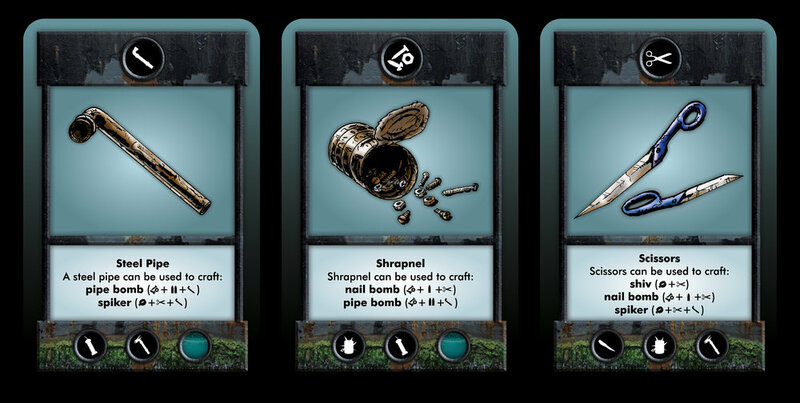 Crafting - Bolt together the random junk you salvage to make melee weapons, pipe bombs, med packs & more. Save Tickets - On "normal" & "hard" difficulty settings ammunition, equipment & infections all carry over to the next chapter, so scavenging and crafting are essential to keep your heroes alive. In normal difficulty players are given three "save tickets" which allow you save your progress. Crates - Random "quick searches" for those all important extra resources. Exodus will be heading to Kickstarter this summer so expect lots of previews and information over the next couple of months. If you can't wait that long to check it out, we will be running Exodus demos on Friday & Sunday at UK Games Expo (stand B23).